A popular theory in painting is that if the values are right, it almost doesn’t matter what colors you use. A viewer can still recognize the scene for what it is. I decided to experiment with that theory in this seventh painting in the Portage Island Cliff 6×6 series. I used complementary colors–the opposite color on a color wheel from the natural color in the scene. I substituted red where there was green in the picture. For blue I used orange. For yellow I used violet. At the same time, I tried to keep the values–the darkness or lightness of the colors–about the same. In other words, where there was dark green I substituted dark red, and so on. Ultimately, the final result was this eerie, somewhat surreal effect. Come to the Studio Tour Sept. 3-4 and you can see the original along with the (hopefully) complete Portage Island Cliff 6×6 series. Filed under Blog. 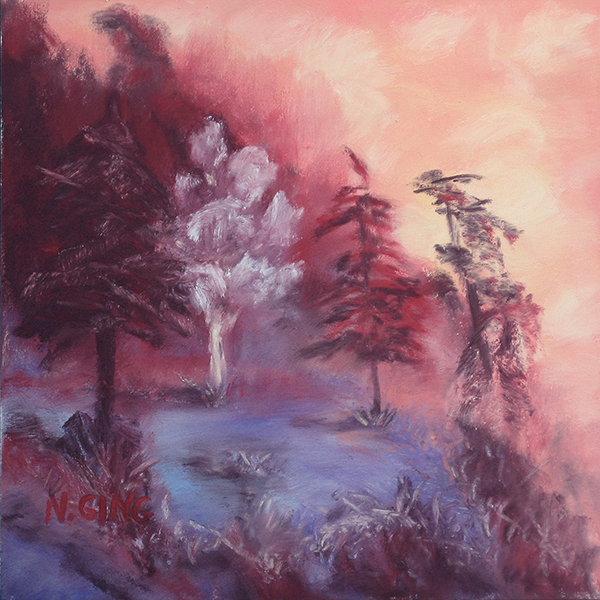 Tagged 6x6 series, color values, complementary colors, Nancy Ging, pastel paintings, Portage Island Cliff.